To view this image on a smartboard click here. Catechetical ministry involves ongoing discernment of God’s loving initiative and the human response of faith to God who reveals. This dimension of catechetical activity is brought to life in an exquisite masterpiece painting titled, Woman Holding a Balance, by the 17th century Dutch master artist Johannes Vermeer. Completed in 1664, this evocative work offers a visual meditation on the art of discernment in catechesis and in the spiritual life. Much of Vermeer’s artistic creativity was focused on genre paintings of close domestic scenes infused with extraordinary spiritual depth. His masterful handling of light and refined compositions draw forth hidden spiritual realities radiating from the calm household scenes, gentle figures, and delicate colors emanating from his remarkable canvases. Woman Holding a Balance is considered one of the finest examples of Vermeer’s ability to set forth the extraordinary in ordinary scenes of everyday, domestic life. This poignant image offers a visual reminder that the extraordinary action and grace of the Holy Spirit is discerned in the ordinary moments and events of daily life. The subject of Vermeer’s masterpiece is a young woman, dressed in a blue jacket with white fur trim, who stands at a table in the corner of a simple room. Her demure figure and humble posture radiate a peaceful calm that invites us into the painting. In her right hand, she holds a set of delicate scales held in balance, revealing her composed spiritual state. Behind her, a large painting of the Last Judgment hangs on the back wall. A luxurious blue cloth, open jewelry boxes, two strands of pearls, and a gold chain are scattered around on the table before her. The most dramatic element in Vermeer’s scene is the soft light filtering into the room through the barely seen window, hidden by a curtain on the left. Light gently illuminates the wall, and the face and arms of the woman who is deep in thought, making one feel as if one is intruding on this private moment of contemplation. The Dutch master uses warm, golden light to flood the painting, eliciting the action of the Holy Spirit in that moment of spiritual illumination as the woman contemplates far more than the scales before her. By juxtaposing the figure of the woman and the scene of the Last Judgment, the artist invites us into the spiritual meaning evoked in this quiet, interior scene. The woman discerns the significance of the earthly treasures on the table before her against the backdrop of Christ’s final judgment. This visual juxtaposition is a reminder that against every act of human discernment lies a final, divine reckoning. The way of discernment, here on earth, is set always against the divine, eternal realities of faith. 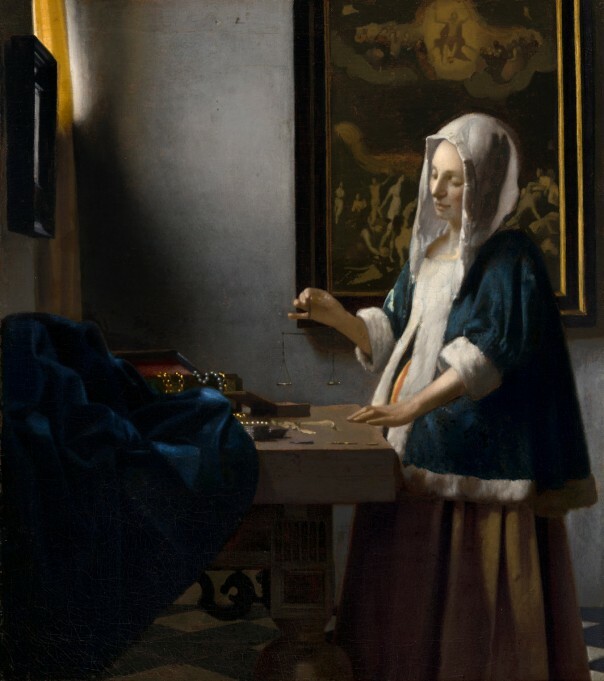 Some commentators on Vermeer’s works suggest that the woman is an image of the Blessed Mother of God. Others propose that this work is an example of a ‘vanitas painting.’ A popular theme in Netherlandish art of the 17th century was reflection on the vanity or changing nature of earthly life set against the unchanging, eternal realities of salvation. The woman holding a balance of scales as she quietly ponders the meaning of life was a visual reminder to keep always before one’s mind and heart the eternal, unchanging realities of heaven. A catechist’s path of discernment begins and continues under the inspiration of the Holy Spirit. In the power of the Holy Spirit, a catechist evaluates and assesses the content and methods of each catechetical session. Catechists serve as vital instruments of the Holy Spirit—the primary agent of evangelization and catechesis, who opens and moves the minds and hearts of those being catechized to respond with faith in Jesus Christ. Like the light warming this interior scene, the light of God’s grace floods the interior life, drawing a person into friendship with God and love of neighbor. And so the master artist, Vermeer, invites us into this ordinary, domestic scene to join in the woman’s quiet contemplation of the extraordinary reality of Christ’s reign and final judgment of the world. Instead of fear, Vermeer invites us to trust in God’s compassion in his divine judgment of the world. For God who is rich in mercy desires that the world he created be reconciled to him in love and friendship. Following the way of divine mercy is a sure path on the way of discernment. Jem Sullivan, Ph.D. catechist, educator, and author, serves as Secretary for Education in the Archdiocese of Washington. She is author of The Beauty of Faith: Christian Art in the New Evangelization and Opening the Door of Faith: A Catechists’ Guide to the New Evangelization. This article appeared on pages 21-24 of the printed edition.